Stanton Street has discontinued support for Internet Explorer version 7 due to a steady decline in the number of people who use it. As of November 2012, version 7 was being used by less than 1% (0.87% to be exact). 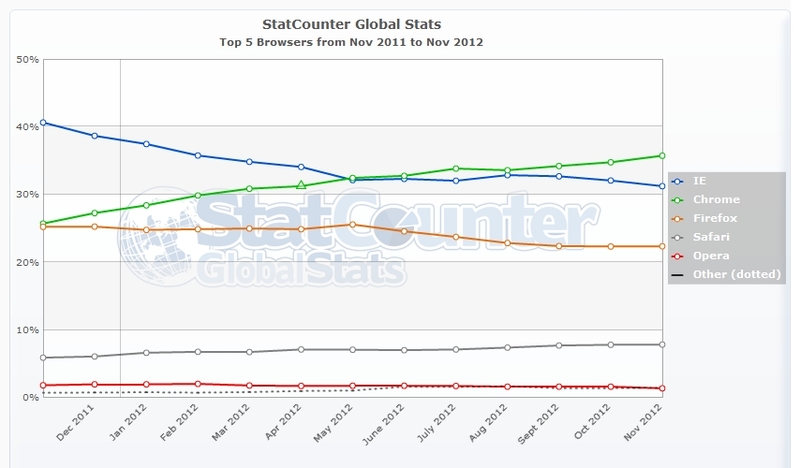 Compare that to 35.72% for all versions of Chrome, 21.06% for Firefox and 17.65% for Internet Explorer 9. Why do we stop supporting certain browser versions? Every time we build a site, we check all top browsers and their versions to make sure it works properly for each one. While there may only be a dozen or so main browsers and versions, every page and all functionality within the new site must be tested. All those pages that don’t work will be fixed and then tested again and then if that doesn’t work… well… you get the idea. It can be quite a consuming task. As browsers continue to update, it’s not the first time we do this and it won’t be the last! Help us help you have the best browsing experience possible by keeping your browser up-to–date. Typically, your browser will let you know when it’s time for an upgrade by displaying messages such as “Click here to update.” If you’d like to upgrade now, visit our friends at Browse Happy. Questions? Comments? Public displays of love and affection? Leave a message here or call us at (915) 351-8440. Stanton Street Is Now Offering Online Political Campaign Services! i think thats just rude, i like IE7 and still using, this is specie-ism.